You may be asking yourself, what is a DEIS DART keeps talking about? DEIS stands for Draft Environmental Impact Statement. As a refresher, a DEIS maps out the positive and negative effects a transit project, like the Cotton Belt, may have on a surrounding area. We know that when large transit projects come to town, there can be an array of effects that can occur, that’s why DART plans ahead, to ensure that our transit projects fit in seamlessly to help best connect residents to our region. Find out the top 5 things the latest DEIS lays out on the Cotton Belt. 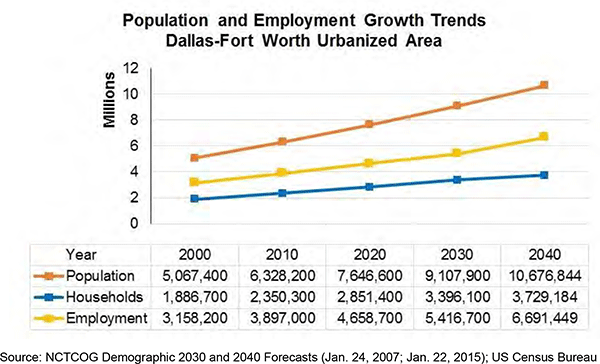 North Texas’ population growth is not slowing down anytime soon—that means we need more mobility options. Population has increased by 25 percent between 2000 and 2010. By 2040, the region’s population is expected to increase by another four million. Furthermore, employment will continue to grow in these areas as well. Check out the chart below to see how important increased mobility will be to sustain our staggering growth and support our population and employment opportunities for the future. You’ll save some time on your commute – even if you’re not riding the Cotton Belt. DART reports that it expects the Cotton Belt line will shave off 80,000 vehicle miles traveled per day by 2040 and save 3,800 hours of daily congestion delays. The Cotton Belt will make critical connections to other forms of transit in our region. This project will connect with the future TEXRail Project (currently under construction), extending to DFW Terminal B Station. As the Cotton Belt makes its way to Carrollton, it will interface with the DART Green Line. Additionally, there will be a side-by-side platform transfer with existing DART light rail at the CityLine/Bush Station. Making sure that the Cotton Belt connects with other transit options will continue to make our entire transit system more flexible for all North Texans. DART is partnering with local groups to develop and preserve a network of off-street trails for hiking, biking, and pedestrian use. DART and the North Central Texas Council of Governments are working together to preserve and build pedestrian bridges, and development and transition to trail access from Cotton Belt where it is convenient and feasible. 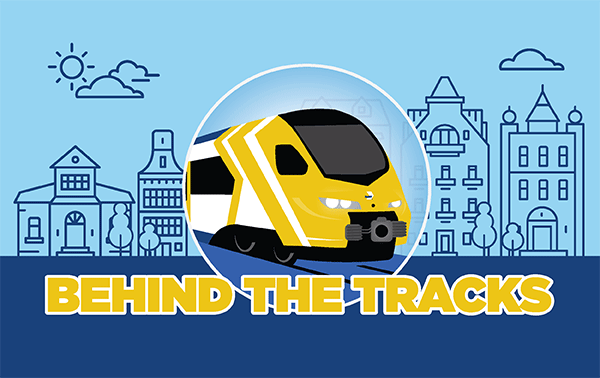 DART is looking to work with the public, just like you, to ensure the Cotton Belt is a success. DART has followed a comprehensive public involvement effort to proactively and effectively communicate the project’s scope, issues, and potential impacts while collecting public, agency, and stakeholder input. This information will be reflected in the final version of the document, Final EIS. Stay tuned as we continue to bring you updates on the Cotton Belt! Want to get updates straight to your inbox? Join now to receive our Cotton Belt newsletters and information on public meetings. This entry was posted in Capital Projects, Cotton Belt. Bookmark the permalink. Will the original plans for an underground section between Addison Road and Richardson be recognized, or will this line be totally on the surface?